We saw Caroline or Change last week at the Den Theatre and it is fantastic. It runs through October 28 at the Den Theatre in Wicker Park. 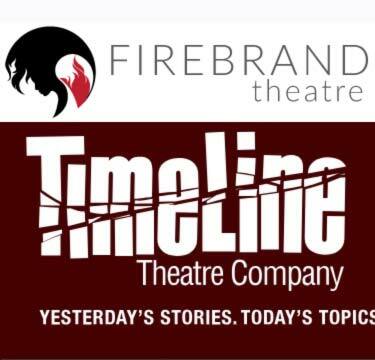 Firebrand Theatre and TimeLine Theatre Company's production of CAROLINE, OR CHANGE directed by Lili-Anne Brown. Photo by Marisa KM. For both their purposes, this play could not be better. Set in Lake Charles, Lousiana at the end of 1963, the show tells the story of Caroline Thibodeaux, a black woman, mother of four, and the maid to a wealthy Jewish family. They are in fact so wealthy that their house is one of the few in the area that actually has a basement. 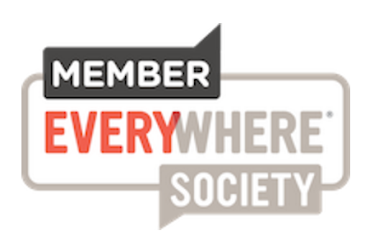 The play deals with racism, classism, the upcoming civil rights movement, and lots more. It's also a play about parenting and growing up. The show was written by Tony Kushner, author of Angels In America, and has an autobiographical bent It's also a musical-- well, musical is the wrong word-- it's more like a gospel opera, with lots of songs throughout, but also many sung lines that aren't really songs, but fit into the world that the theatre artists have created. 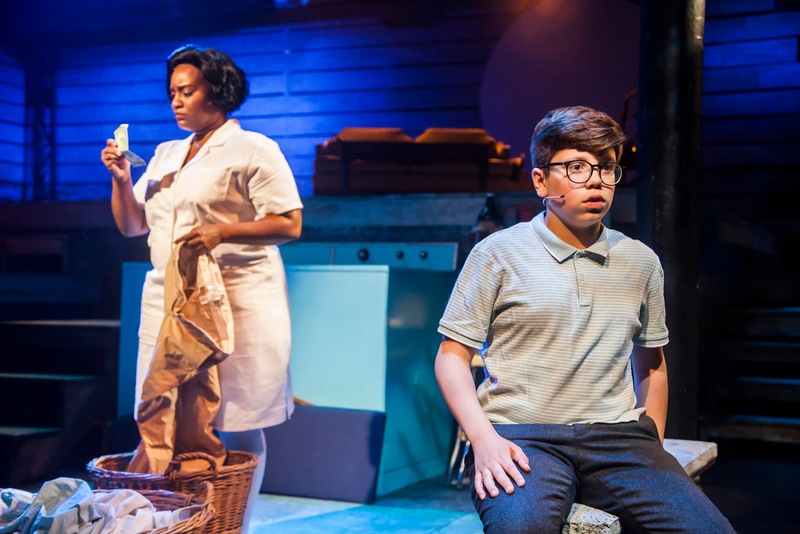 The music was written by Jeanine Tesori, who also wrote the music for Fun Home. directed by Lili-Anne Brown. Photo by Marisa KM. 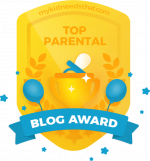 Every actor in the show is terrific, but special kudos have to go the lead. played by Rashada Dawan. 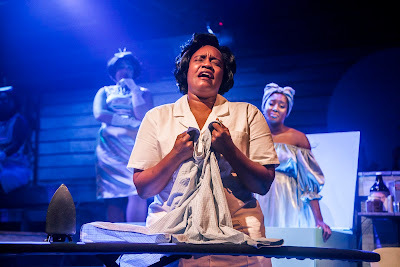 From the moment she enters the stage, she inhabits the role, foot tired, bone tired, doing laundry and menial tasks in the very hot basement in the middle of the deep South. Her voice is stellar, her acting is phenomenal, and her ability to display the love and hate that she has for her employers are palpable. I'd like to shout out everyone in the cast, but I have to especially mention Alejandro Medina, who is 12 or 13 years old and handles himself like the professional actor he will one day be. He's a great singer and dancer, but his ability to project his character and stay in the scene with the other actors was really wonderful. I also thought that Micheal Lovette, who plays the Bus/Dryer was funny, moving, and has a tremendous voice. And Blair Robertson who plays the mother Rose does a great job as well. She's not Noah's mom, she's a step-mom, and she plays that awkwardness perfectly. I also want to shout out the live band, who plays gospel, klezmer, show tunes, and just about everything else perfectly. They are out of sight, underneath the stage, but you know they are working it. They sound fantastic. 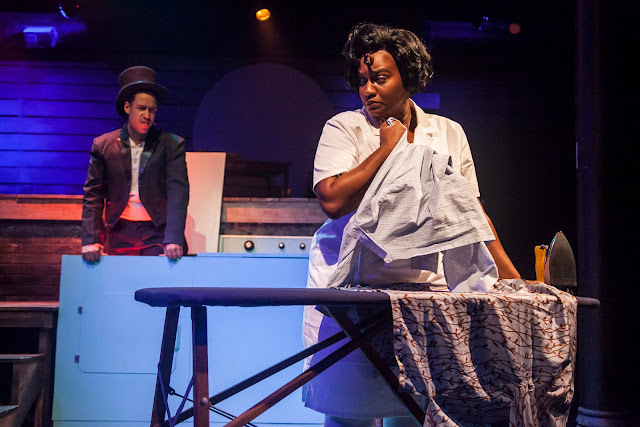 Micheal Lovette as the Dryer and Rashada Dawan as Caroline in Firebrand Theatre and TimeLine Theatre Company's production of CAROLINE, OR CHANGE, directed by Lili-Anne Brown. Photo by Marisa KM. The show also has a large Jewish element. At Channukah, Rose's dad comes up from New York. He's a civil rights activist, and is predicting and fomenting for revolution and change. 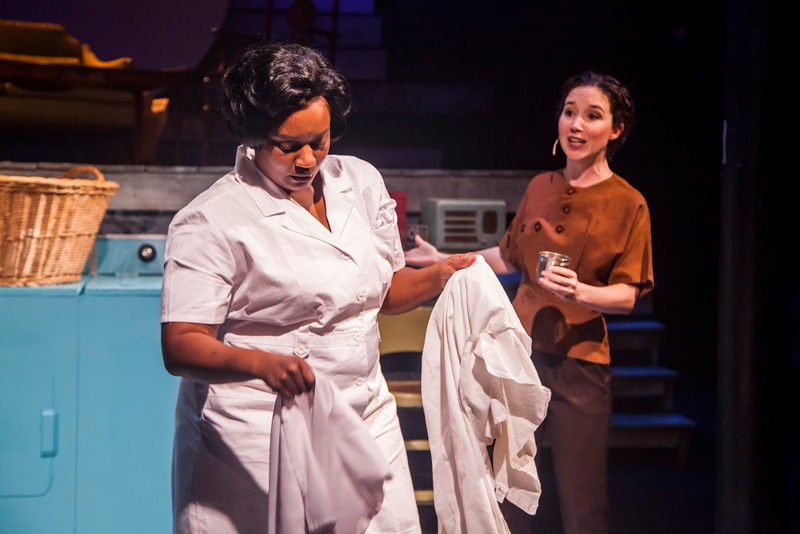 Caroline's daughter (helping to serve that night) is taken to task for engaging with him and talking about Dr. King. The Gellman family at Chanukkah with the grandparents. 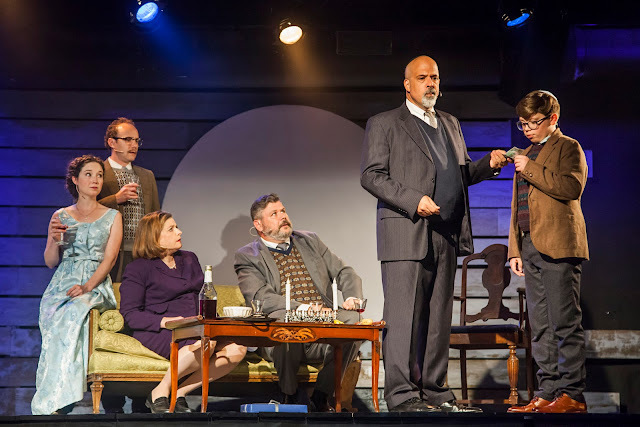 Blair Robertson, Jonathan Schwart, Rosalind Hurwitz, Kevin M. Grubb, Michael Kingston and Alejandro Medina in Firebrand Theatre and TimeLine Theatre Company's production of CAROLINE, OR CHANGE, directed by Lili-Anne Brown. Photo by Marisa KM. In short, this play is well worth seeing and you should definitely see it before it goes away. It will entertain you, make you think, and will give you new awe for the power of voice and words to move emotions. WHERE: The Den Theatre, 1331 N. Milwaukee in the Wicker Park neighborhood.